Water scarcity and pollution is already a major component of China’s environmental crisis and it will only worsen as the energy sector, including renewable energy, expands. As illustrated in Figure 1, the production and use of coal accounts for up to 20 percent of China’s national water withdrawals. At the same time, the development of hydropower in southwest China affects river ecosystems and often is correlated with the development of highly polluting industries. Similarly, while the booming clean energy industry may alleviate air pollution, some renewable energy sources, for example concentrated solar power, demand a significant amount of water placing more pressure on the country’s hydro resources. To bridge the widening gap between scarce water supply and growing demand, Chinese policymakers are pursuing alternative solutions such as wastewater treatment, desalination, and the great South-North Water Transfer Project. These, however, have huge costs in terms of energy consumption. The challenge then was to design an infographic showing how energy has become both a financial and operational burden for “making” freshwater. 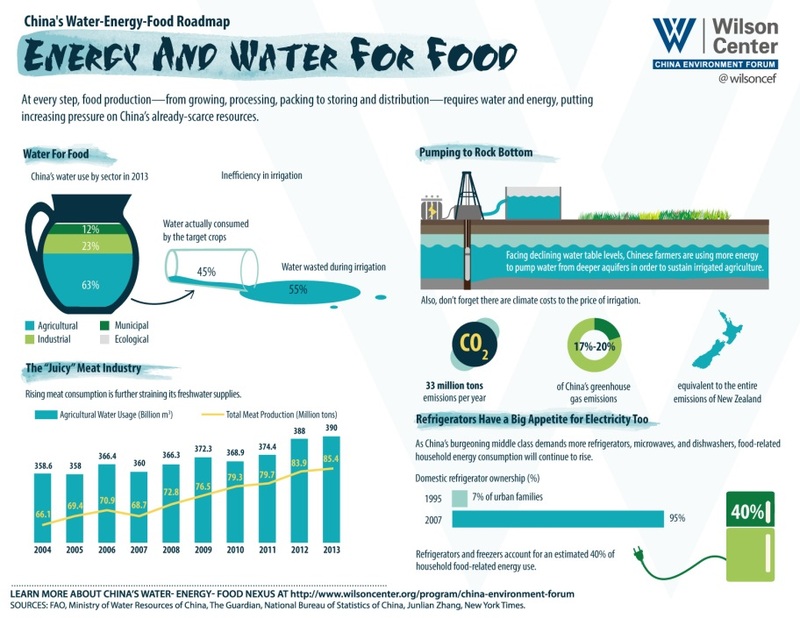 The food production cycle, from farming and processing to packaging, storage, and distribution, has a large water and energy footprint as well. In China, the rising domestic demand for food and inefficient use of resources is increasing the amount of water and energy used to irrigate farmland, produce meat, and power modern kitchens. 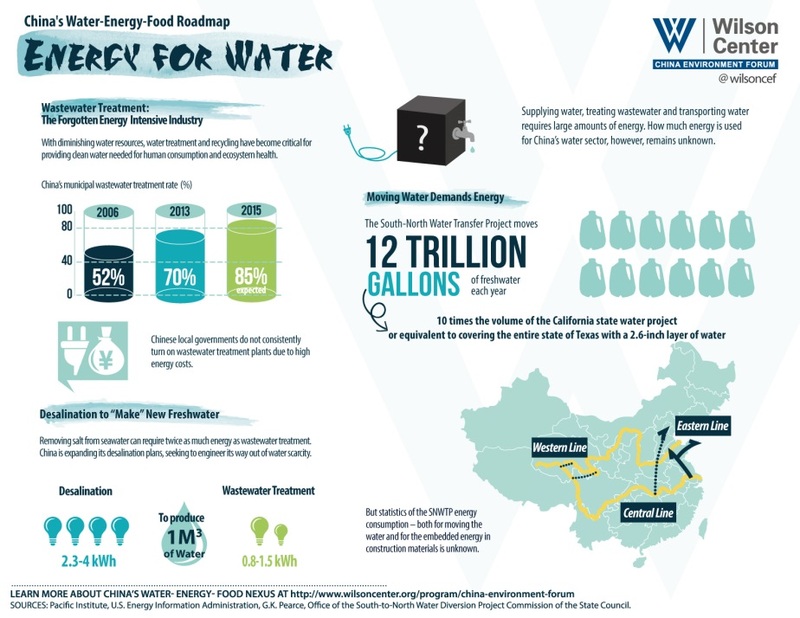 These infographics were created to provide an engaging and interactive reading experience for a wide range of audiences – from policymakers and NGO practitioners to corporate executives and students – to encourage deeper discussion on China and the rest of the world’s water-energy-food choke points. 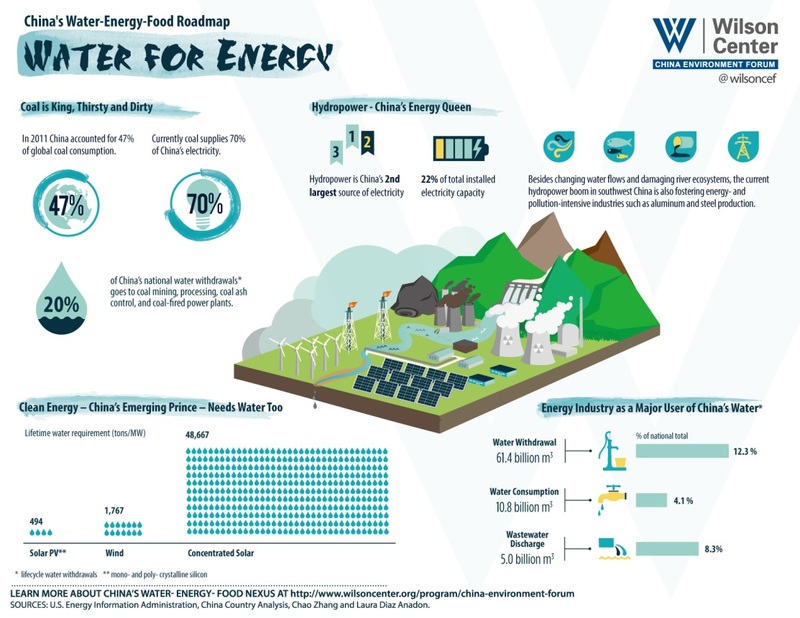 Download ‘China’s Water-Energy-Food Roadmap’ from the Wilson Center’s China Environment Forum. Siqi Han is a Master’s candidate in environmental economics and policy at the Duke University Nicholas School of the Environment. Infographics Credit: Siqi Han/China Environment Forum. Why are you spreading fear? do you work for corporation? I have recently been to china to see the work they are doing with water. This is spreading fear stop writing about whats wrong and start supporting whats being done right! if we show the good the bad falls away never to be seen again. spreading the new techniques and old ones helps others to do the small part to clean wate. the corporations and scientists will never heal the world its everyday people’s waking up to the fact they are the powerful healers of hte earth . I don’t see this as fear-mongering. I see it as a useful articulation of the intimate relationship between water, energy and food. Making water visible in the production (and consumption) process is an important part of amassing the empirical evidence to press for policy change and better practice.